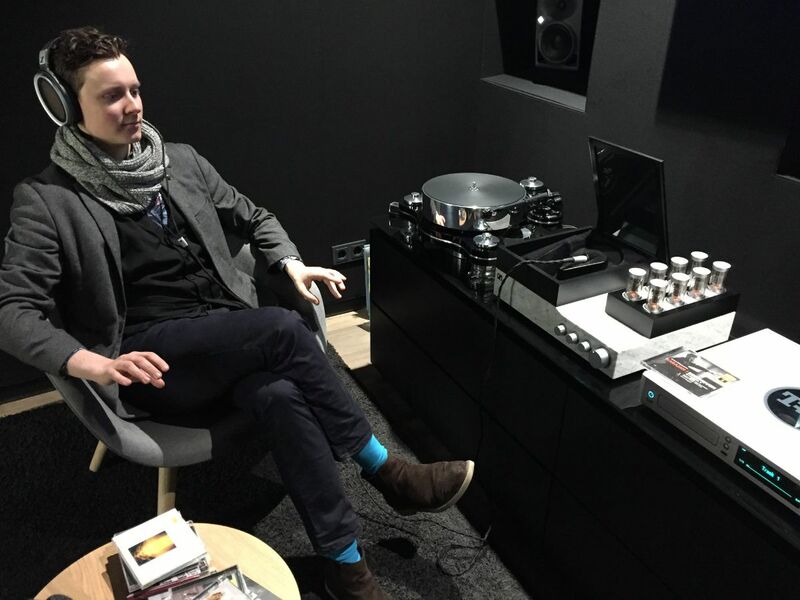 A picture from our archive: Exactly one year ago, Social Media Thomas has visited Sennheiser’s Berlin Store and listened to Herbert von Karajan’s 1963 version of Ludwig van Beethoven’s Symphony No. 9 and other masterpieces via Sennheiser’s Orpheus. This headphone including amplifier is considered the world’s most elaborate headphone system and costs around 50.000 Euros. In 2017, Sennheiser has exhibited this headphone type at our very first #KarjanMusicTech conference in Salzburg. Quality attracts: If you enjoy HiFi music, get inspired in Sennheiser’s Berlin flagship store and listen to Karajan! Thorsten Rohde is MD of Rohde Acoustics, co-founder of Amadeus Acoustics and a court-certified expert in acoustics and noise prevention. His teaching activity at the Technical University of Graz includes the “sound studio equipment” and seminar “room acoustics and audio electronics” as well as the support of various sound engineering projects in the field of acoustics. At the University of Music and Performing Arts Vienna, he teaches acoustics for sound engineers. Aurélia Azoulay is a young French-Israeli entrepreneur with a passion for music and technology. She worked for several years with the Opera de Versailles before launching Newzik’s digital sheet music paper project for orchestras. Quad-lingual, she travels around the world to support all the Symphonies and Chamber Orchestras in the digital transition. Patrick van der Smagt is director of the open-source Volkswagen Group AI Research Lab in Munich’s Data Lab, focussing on probabilistic deep learning for time series modelling. He previously directed a lab as professor for machine learning and biomimetic robotics at the Technical University of Munich, and was the head of bionics at the German Aero Space Center DLR Oberpfaffenhofen. Please check our Speaker Section for daily updates on new speakers! Imagine you could understand who your audience is, why and what content configuration they prefer. Sophie Brüggemann developed a multi-dimensional approach which allows an algorithmic segmentation of music streaming audiences and their consumption behaviours. This empirical research combines behavioural and psychological studies with market analysis and usage data by means of concatenating data analytics. Hear about it during Sophie’s talk “From metadata to algorithmic listener segmentation” during our third annual conference on April 12th. Recently, Karajan Music Tech Conference speaker Nina-Sofie Berghammer has published her first violin loop station song GFESD. Listen how she combines violin sounds with her loop station. According to Technology Review, researchers from the University of Texas and Facebook Research have created an AI system that converts mono sound into immersive 3D sound. The result from emulating the interaural time difference and volume changes is called 2.5D sound. A video shows how it creates this vivid sound impression from moving objects in videos. The article calls it “synthetic 3D sounds that convincingly fool our aural systems”. Pretty awesome. Nina-Sofie Berghammer is a 14 year old multi-instrumentalist wunderkind (Violin, Piano, Marimba) from Linz, Austria. By fusing Violin sounds with her loop station, she is adding a modern touch to Classical Music. Her biggest role models are David Garrett, Aleksey Igudesman and Hilary Hahn. Since fall 2016, she attends the Mozarteum Salzburg University as an early student. In 2018, she played her own concert in more than 50 events. One performance at the Audi Dome Munich had 7000 visitors. Sophie Brüggemann is Data Analyst at Spinnin’ Records and PhD candidate at the Ludwig-Maximilians-University of Munich. After working in the marketing department of Sony Music Entertainment, she specialized at the intersection of consumer research and business analytics. At Spinnin’ Records, she is currently refining marketing strategies. She graduated with honors with an M.A. in Media Communication & Musicology. Her PhD thesis is titled “Rating consumption behavior of music streaming users by means of concatenating data analytics”. Did you know? In October, Karajan Cinema Classics won the Creative Craft Award from the China Motion Picture Association for our 3D sound remix of Beethoven’s Symphony No. 5. What an honor to receive the award on behalf of the team! We thank our technology partners ARRI, Dolby Atmos & FD Film Salzburg! Our alumnus Dear Reality has published their new product dearVR SPATIAL CONNECT. It’s a tool for 3D Audio Production. Here, you can mix spatial audio in VR for the first time. What piece of Alumni News would you like to share? We’re happy to hear from you! movements and facial gestures. How is it done? The foundation is a 99 US$ eye tracking device and a regular PC webcam. The open platform aims to foster inclusion. Read more here. 易 Brain.fm personalizes music. It also helps you to sleep and concentrate. Tahlia Petrosian is a member of the Viola Section of the Gewandhaus Orchestra and the director of KLASSIK underground. KLASSIK underground aims to fuse Classical Music with modern urban nightlife. Discover 3D-printed music instruments live at Karajan Music Tech Conference 2019! Music performer, teacher and researcher Ricardo Simian helps new generations to rediscover ancient instruments’ sounds by producing accurate 3D copies of extinct instruments. Being THE up and coming cellist and conductor, Peter Gregson is a real stroke of luck for our conference. His current masterpiece is a modern makeover of J.S. Bach’s Cello Suites. This is our first MusicTech Blog Post in 2019 – but for sure not the last one! From now on, we share community news and MusicTech insights on a regular basis. In 2019, we want to foster our creative Music Tech community even more. So please don’t hesitate to send your Alumni News in or ask for a local Karajan Music Tech meetup. We’re happy to hear from you! Besides our beloved 3rd Karajan Music Tech Conference (April 12th, Salzburg), there’s another conference you shouldn’t miss: save the date for the very first Karajan Research Conference in Graz (April 29th – May 1st). As part of the Karajan Research project, this conference aims to provide a platform for bringing together a wide variety of disciplines and perspectivesto explore and broaden the field of interpretation research. Check it out here.